When I think of Christmas as a child, I swear I remember it looking just like the image above in my mind. Every visual of that era showed it that way. I can even hear the music that’s playing in that scene. It’s “I Saw Mommy Kissing Santa Claus” in case you were wondering. Oddly, my dad didn’t smoke a pipe. And I don’t remember him ever climbing a ladder to do anything, especially if it involved leaning into a tipsy tree. Speaking of tipsy, my mom did decorate the tree with great enthusiasm every year. One year, the enthusiasm was helped along with some Hamm’s beer and she decided to “flock” the tree after the ornaments had been hung on it. The snow hangover lasted on those ornaments forever after. In fact, I still have a couple of them. When I think about it now, her idea does seem kind of creative in some ways. 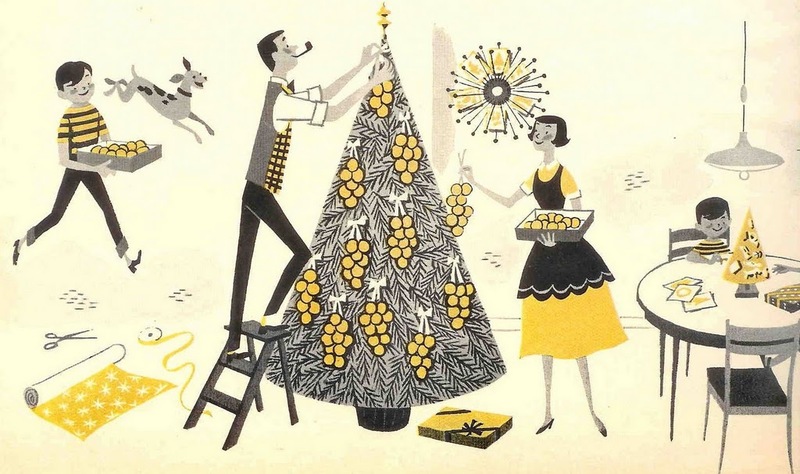 But the snazzy illustrations weren’t the only depictions of the perfect Christmas that colored my perceptions for life. There were images of real people, like these. There was plenty of this sort of thing around, mostly in the Christmas catalogs that arrived at our house sometime in October. We’d pore over them, as did all our friends, marking what we wanted, making lists, dreaming of getting things like those strange costumes that they sold — like you could dress up as a nurse or an astronaut, for example. Did anyone really ever get those? If you did, I want to know about it. I don’t remember them being cheap either. Then there was the music. 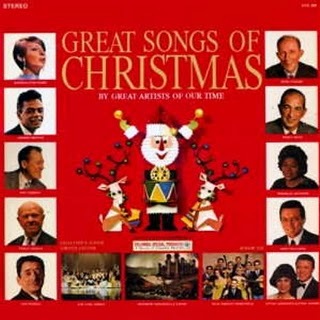 Sorry kids, but I’m pretty sure my childhood was the golden age of Christmas music. I mean, Andy Williams was just starting out when I was a kid, so you do the math. Or whatever you need to do to realize that “It’s the Most Wonderful Time of the Year” was a pop song then. My dad traveled for his job, so he’d bring home these albums every year from the tire stores. They were fantastic! We played the bejezuz out of them. I have no idea why they came from the gas stations or the tire stores, all I know is they were great and we loved them. 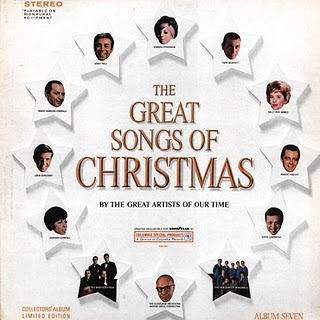 Here’s a blog that’s dedicated to the entire concept of the Goodyear Christmas album. Seriously. If you’re the curious type, I found a gem for you. I remember the Goodyear albums being more hip than the Firestone ones. 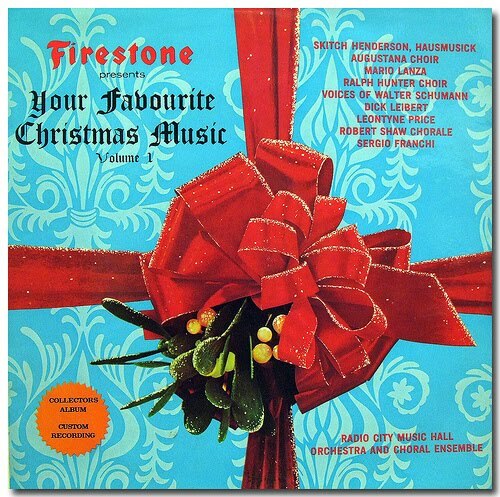 The Firestone albums leaned more towards the Ray Conniff Singers, the Goodyear people snagged Barbra Steisand and Johnny Mathis types. Let’s talk presents. 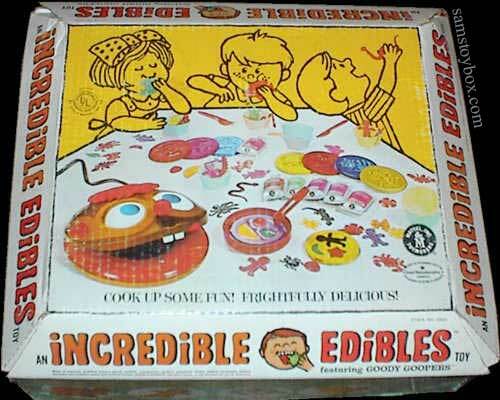 My parents let us open one gift on Christmas Eve when we were young kids. We’d get into our pjs, leave the cookies (and beer) out for Santa, and then we each could choose one gift from under the tree to open before we went to bed. 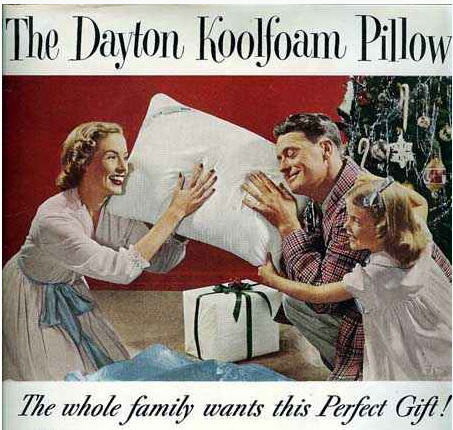 Mind you, the gifts under the tree had come from non-Santa sources, so you never knew what you were going to get. We’d shake them, and discuss the rationale of opening a large gift vs a small gift. My mom’s best friend lived in Brooklyn Heights and she sent the most amazing gifts to us in Iowa. I still have some of them. One year, my brother and I had a gift from her that was to both of us, so we bit the bullet and opened just that one. We decided to do this because the noises it made were irresistible. I can’t find an exact picture. The instruments were from FAO Schwartz and were made by Ludwig, and our set had these too. I’m sure my mom did plenty of things to her friend back in the day to warrant her sending us this. I’d give anything to still have these. We had a literal riot with them for many years. Around the time I was 5 and my brother was 6, we each got a tin toy from Marx. Mine was this exact dollhouse, (photo courtesy of Etsy) and his was this gas station. We didn’t know until many years later that my parents had to put these dreaded objects together in the basement on Christmas Eve. As the story goes, after several hours of swearing and slicing of fingers, the gas station finally made its way up the stairs, almost making it to the top until my dad dropped it all the way back down. It truly must have been the wee hours of the morning, since we heard nothing. 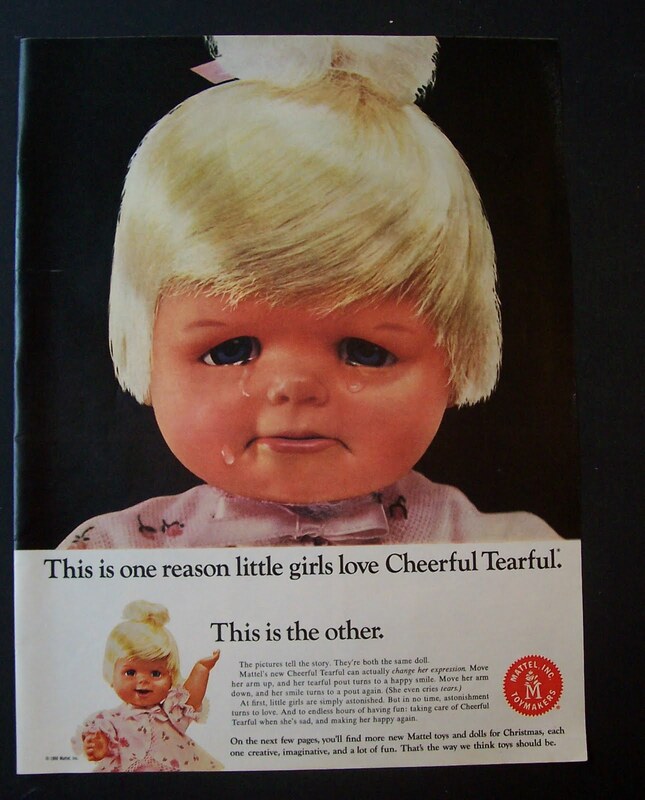 When I was around 7 or 8, the only thing I wanted was this ridiculous doll named Cheerful Tearful. You’d feed her a bottle of water, then yank her arm down and she’d cry real tears. 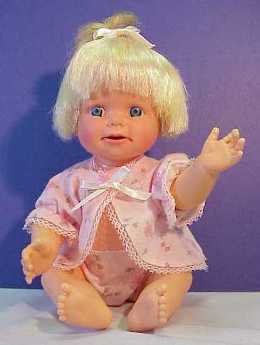 I wasn’t really a doll person, so I have no idea why I wanted this so much. I think it had something to do with the propaganda in the ad below. Leaving dolls behind, I guess it was time to learn some homemaking skills. 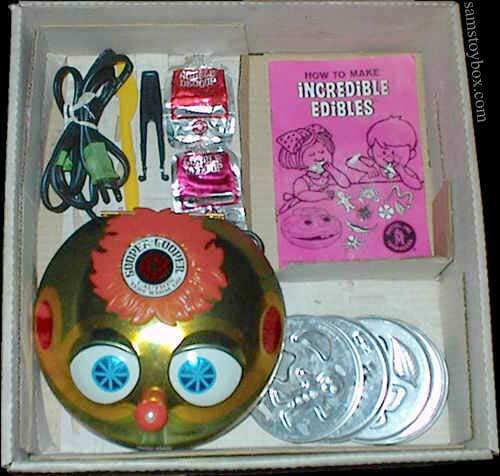 So one year I got the most disgusting toy ever, also one of the best: The Incredible Edible maker. Not lying; you poured this goo into this electric hot thing that plugged in, and made these horrid critters that you ate. Flavors like mint, root beer, cinnamon and cherry tempted your palate. Of course we soon ran out of the goo. I don’t ever want to know what it really was. But the natural progression was to find any plastic object we could to put into the hot thing and melt it into oblivion. It did great things to those plastic school rulers, and the smell of burning Silly Putty left a strong sense memory with me as well. This hilarious blog collects memories from Incredible Edible victims, I mean fans. 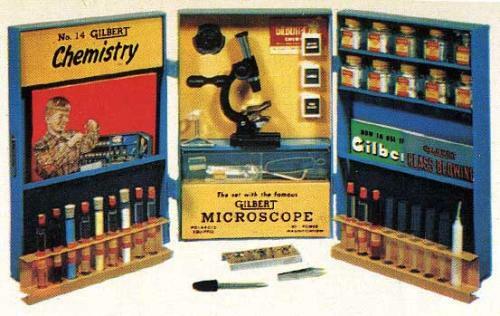 I got the thing to cook goo with, and my bro of course got this chemistry set. It had the parents’ seal of approval on it. Cause it was like, educational. It was a matter of days before it was taken away and never seen again. As if it the trouble was our fault. It actually contained instructions on how to mix explosive formulas. We were quick studies. 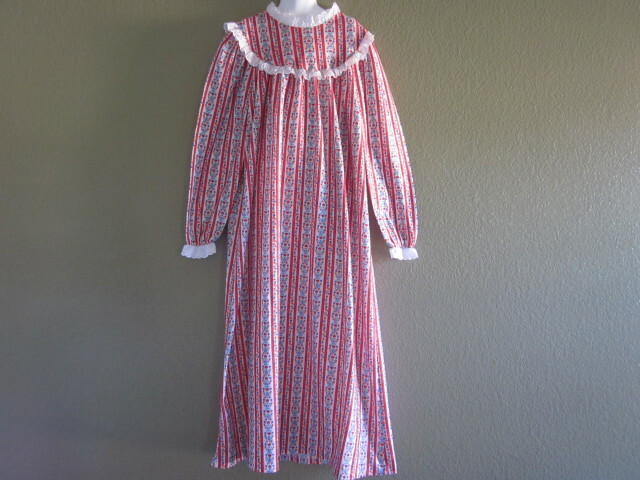 a flannel nightgown from Lanz of Salzburg. My mom had to order it from the Vermont Country Store catalog, which in itself was magical to me. I wore it and wore it and wore it. May have even gone to college with me. I marvel now at how well-made it must have been. 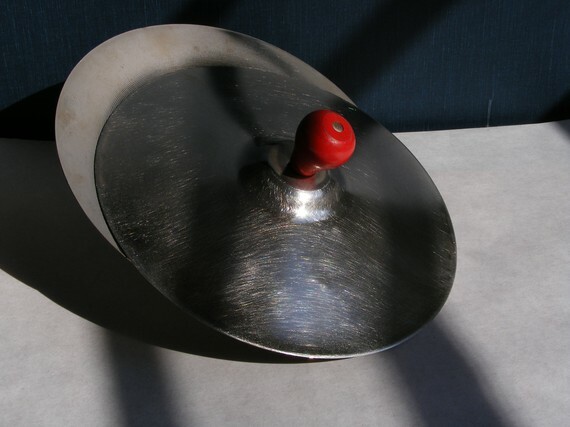 In fact, how nice would it be to have one of these now? There was nothing like coming home from a hideous day of high school and hiding out in my flannel security blanket/nightgown. Hm. This idea’s growing on me. I might have to check out the Vermont Country Store catalog right now. Just might be the perfect way to bring back some of Christmas past. Here’s my favorite holiday tune, by the way. Fantastic and hilariously funny. Happy christmas! Love your slightly tilted walk down memory lane. Merry Christmas…again!! Well this post was absolutely delightful and brought back MANY childhood memories. Some of those album covers even looked familiar. Have a merry one. 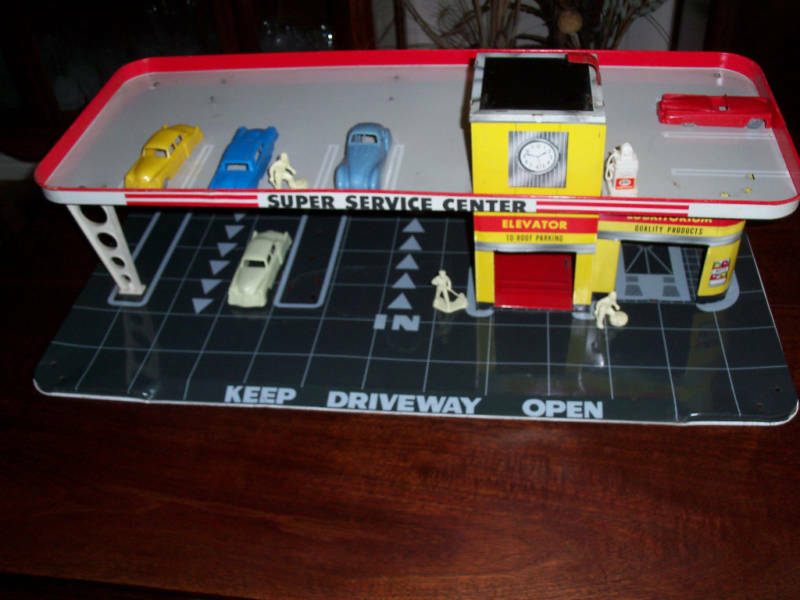 Remembering the gas station……. Thanks. Great post. 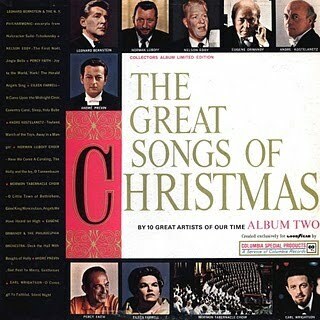 And my favorite Christmas album is also Dean Martin's. I can't believe I missed this until now. My roommate and I DEFINITELY have the Julie Andrews Firestone album. We listened to it constantly this year. Love it! Thanks for the great post! 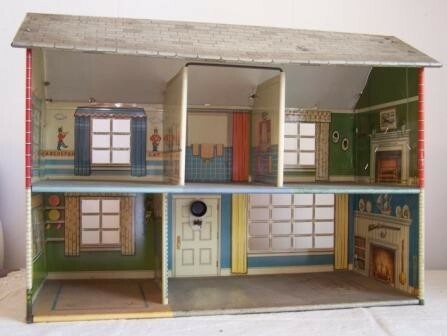 I have that EXACT dollhouse! Gonna browse around your blog for a bit… see ya!